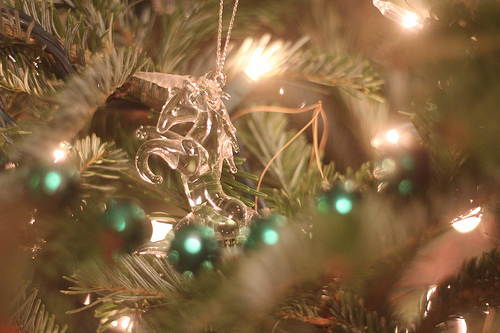 Being the shamateur photographer that I am, my mantra is the deeper the depth of field… the nicer the photograph 🙂 So I pulled out my 1.8 lens and took some photos of some of my favorite ornaments on the Christmas tree to share with you today. If you look back through any of the posts about my dog, you’ve no doubt seen my Springer Spaniel, Eliot. He’s my baby, and springers in general are such a beautiful breed – so I collect all kind of liver & white Springer Spaniel stuff like a good crazy dog person does. 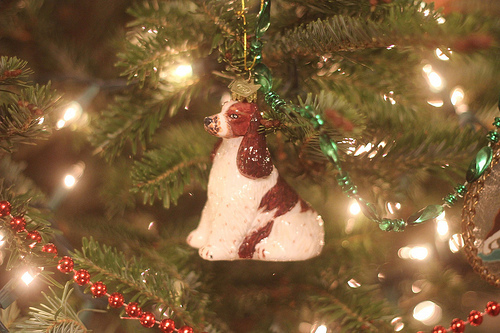 We have several springer ornaments, but this is my favorite. My Mother in law gave it to me from this amazing little boutique store in New Orleans. Palominos are another running theme on my tree. The first horse I ever loved was a Palomino, and I have a huge soft spot for them. This guy is an old fashioned parade horse, but he reminds me of Trigger. 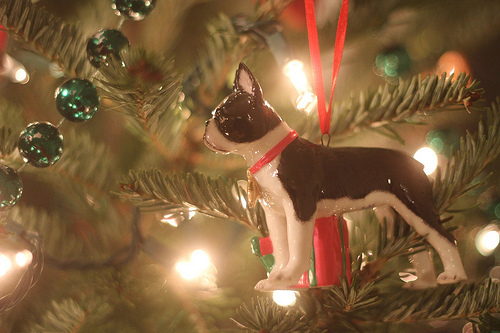 With all of the Springer Spaniel ornaments I have, I needed to get some Boston Terrier ones as well so our 2nd dog wouldn’t feel unappreciated. This is my favorite of those, even though it looks like a way more regal version of a Boston Terrier. My BT is more sweet and goofy! 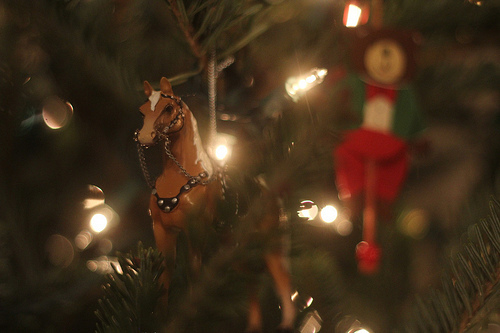 It’s safe to say 60% of the ornaments on our tree are horse ones. The remaining ones are 25% dogs, 10% robots/Star Wars and 5% actual Christmas themed things. The mother of one of my figure skating students gave me this ornament, and I adore it because of the horse’s bascule and polo wraps! She used to ride hunter/jumpers as a youth, and knows a good jumper when she sees one. 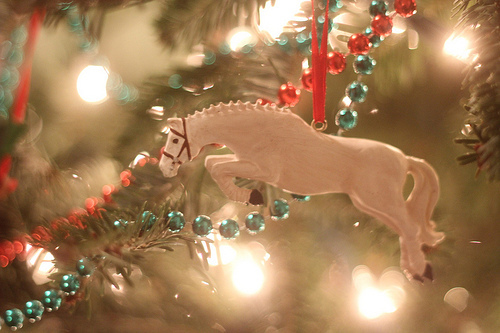 I’ve been through an embarrassingly big model horse phase more than once in my life, and this is one of my Breyer ornaments from that era. Like the first Breyers I had as toys, most of my Breyer ornaments have at least 1 broken leg. This pretty little Arab has stayed in one piece, which is why it’s featured here. Overall, I’ m not a super huge Arab fan. This is an oldie goldie circa 1997. Does anyone remember Weiss Tack? It was this old Dover type establishment that I used to loooooove getting catalogs for, but has since closed or got engulfed by Dover… not sure which. 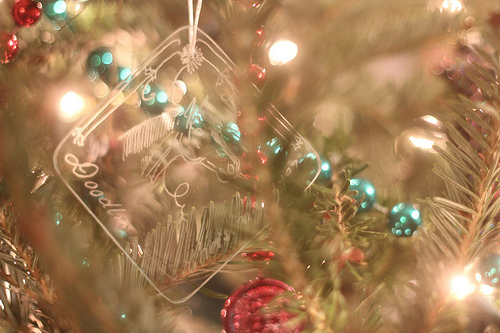 Anyway, during the holidays they would sell these custom glass etched ornaments. 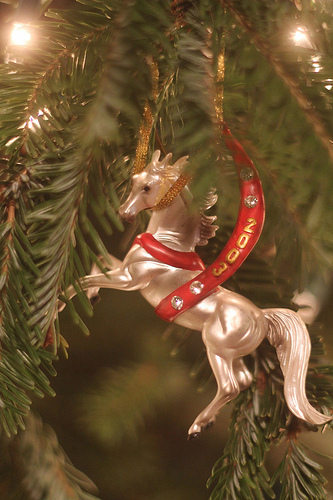 You picked your horse’s breed, their name, and the year and you’d get this glass ornament for $20 or so. I have three, but this is the most special. Doodles is the aforementioned first horse I loved, the gentle Palomino, and one of those great horses that you still get teary eyed thinking about. He always goes near the top of the tree. Lastly, this tiny little glass unicorn has been around since I can remember decorating. I’ve kept him and featured him here as proof that I’ve been horse crazy as long as I can remember. The minute I figured out unicorns weren’t real, I switched on to horses and haven’t looked back sense. I hope everyone is having a happy holiday with their loved ones, and relaxing with a glass of wine and new presents for your pony! I’m heading down to NC to visit my family for a few days, so have some end of the year and 30 day challenge posts in the queue while I’m gone. I have that exact white jumper horse and it is one of my favorites too!! The horse looks just like Wicket and it is designed correctly in every way – which, of course, NEVER happens when non-horse people design horse things!